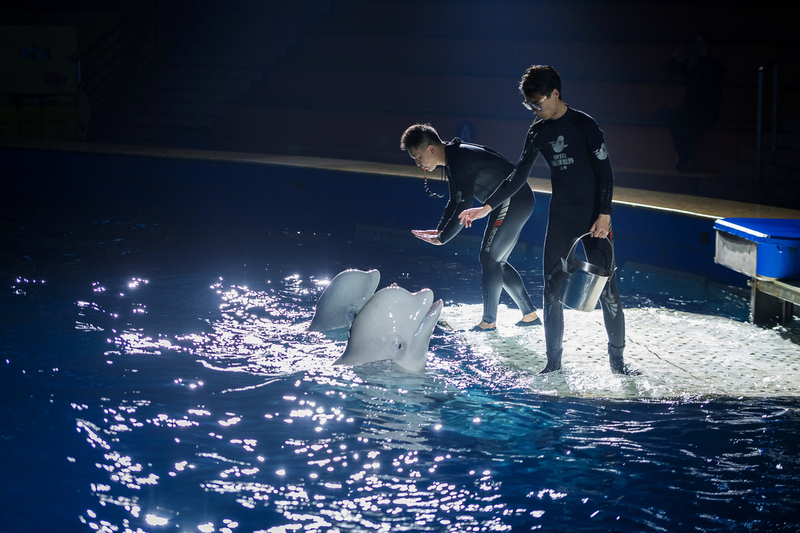 Shanghai Changfeng Ocean World's most popular stars, two female beluga whales named Little Grey and Little White, gave their last public performance on Jan 4. The 12-year-old sisters are now being prepared for a move to a new home more than 9,000 kilometers away in an open-water sanctuary in Iceland. Visitors can still get a glimpse of them and their preparations for the big move this spring through videos. "The relocation of these whales is meaningful," said Hao Yujiang, from the Chinese Academy of Sciences' Institute of Hydrobiology. "This move is a significant indicator that people are changing their perspectives of animal protection, and more attention will be drawn to this issue." Backed by Sea Life, the world's largest chain of family aquariums, and by Whale and Dolphin Conservation, the Sea Life Trust Beluga Whale Sanctuary is in a natural sea inlet in Iceland's Klettsvik Bay. There is a land-based care facility and a visitor's center. "The establishment of the sanctuary is a milestone in the protection of marine mammals," said Zhang Qi, regional general manager of Midway China, a subsidiary of Shanghai Changfeng Ocean World owner Merlin Entertainments. "We hope the project will influence more organizations to do the same, as well as provide new solutions regarding the rehabilitation of more captive whales in natural environments in the future." The sanctuary, which is set to be completed later this year, will offer limited and discreet viewing of whales for visitors. Fees will help offset operating costs. "The viewings will be very carefully controlled to ensure the two whales are not disturbed in their new natural environment," Zhang said. Because marine experts must take into account many factors - such as ever-changing weather conditions and the animals' health - the departure date for the two whales has yet to be set. However, preparations for the move have begun. Trainers most familiar with Little Grey and Little White will accompany the whales on the journey to the sanctuary. A team of world-leading veterinarians and whale experts have also designed a special training program for the whales. The program includes introducing them to the equipment that will be used during transportation, fitness conditioning so that they have enough strength to swim against the currents in the sanctuary and increasing their calorie intake to help them put on extra blubber for colder waters. The team will also introduce the whales to Icelandic shellfish, algae and plants to help them build confidence in interacting with local wildlife in the bay. "This is a complex and logistically challenging rehoming project of two well-loved beluga whales," said Rob Hicks, the director of Merlin's animal and welfare department. "Little Grey and Little White are highly intelligent marine mammals and are fast learners, but we are taking all precautions to protect their health and well-being. "A team of vets will be with the whales at all times during their transit to monitor their welfare and ensure that the relocation is successful." The world population of beluga whales, an endangered species, is difficult to estimate because the boundaries of some groups overlap geographically or seasonally. In 2008, the International Union for Conservation of Nature estimated the population at more than 150,000. "Hunting and global warming are the two major threats to the whales," Hao said. "The demand from aquariums also affects their numbers."